You love your home, you've made eighteen years of memories there and now you are forced to sell it. How would you react? That's the scenario explored in House and Home, the first novel by writer and HGTV columnist Kathleen McCleary. Although she seems to have been living the perfect life (she runs her own business, has two adorable children and is surrounded by loving and supportive friends), Ellen Flanagan suffers a crisis in her relationship with her husband Sam that, combined with an earlier tragedy, results in an obsession over the family home... a home that has already been sold. 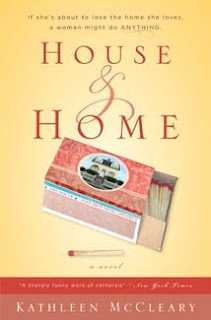 Anyone who loves their home will relate to this novel, and we empathize with the frustration and resentment felt by Ellen when her husband's unsuccessful business venture leads the family into financial hardship resulting in the sale of Ellen's beloved cottage to the preppy Jordan Boyce and her husband Jeffrey. Not only does she have to leave her cottage but she is forced to listen to Jordan's plans to remodel all the things she loves about it - the colors, the moldings and even the picket fence. By turns comic and poignant, the novel is a page-turner; we sense a crisis is coming but we're unsure what form it will take. How far will Ellen go to keep her home? Can she renege on the sale, will she ruin someone else's marriage or even burn down her cottage to ensure Jordan doesn't take possession of the house? Eventually priorities become clear, and Ellen realizes that she must hang on to the important things in life. The author leaves the reader to answer the ultimate question: What makes a house a home? This book review is a stop on the House and Home TLC Book Tour. Oooh, I hate that Jordan Boyce already. This sounds good. I've had those thoughts in my head, what will the next owners do with MY house? Why do I torture myself this way? Great review!! I felt the tension while reading this book too.. what is she going to do? How far will she go to keep that house?? Thanks so much for all the time you put into reading and reviewing House and Home! I think we all love our homes, especially when we put in the work for it. Imagine what it must feel like if you were forced to give it up. Thanks for the review, I'll definitely check out the book. The Guy also read this book and now wants to move to the Pacific North west where House and Home is set - I think he was seduced by all the coffee references as much as the gentle climate! What makes a house a home? Such a good question. I had a weird/sad/funny dream about my old home a couple weeks ago. Maybe I'll write about it. The current house is just that - a house. I'm going to order that book; sounds like a good read.